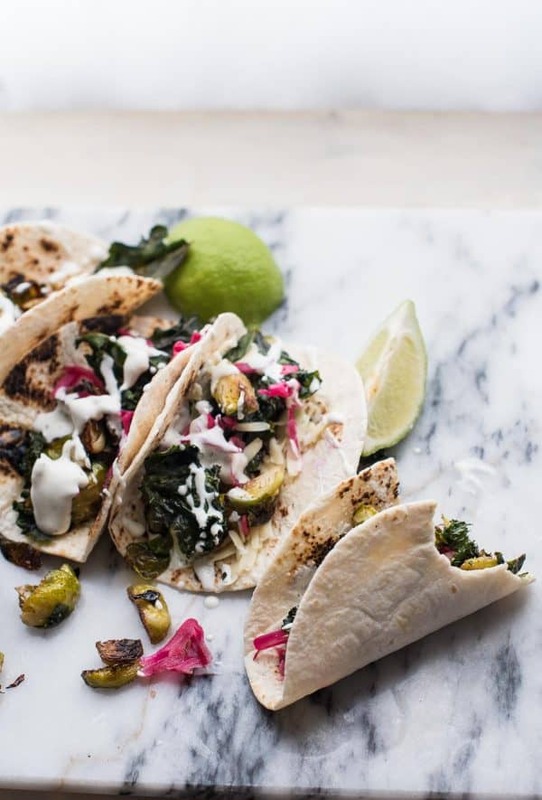 Soft and warm tortillas stuffed with melty cheese, roasted brussels sprouts, crispy kale, tangy pickled cabbage and spicy wasabi ranch. 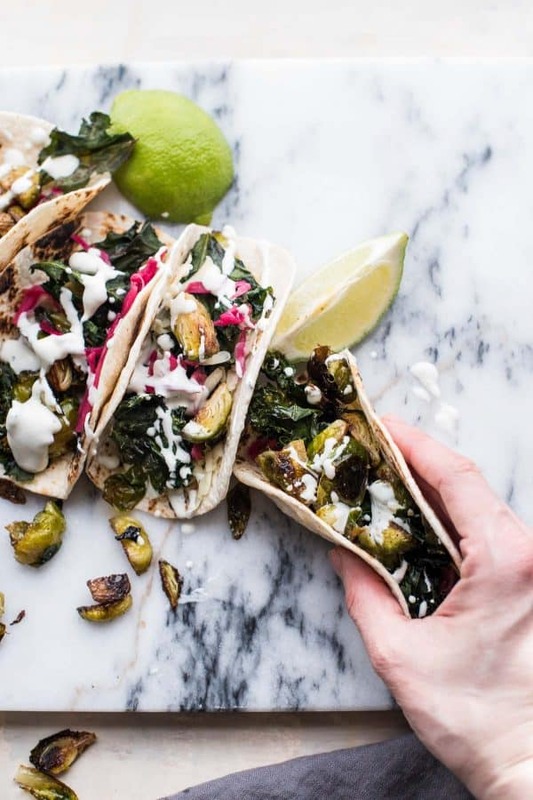 Crispy kale and brussels sprout tacos are the best vegetarian tacos you will ever have in your life. Waaaaaait. JUST HEAR ME OUT. Listen, I know sometimes my love for kale goes to a whole new level and these tacos seem like I’ve kind of taken it there. 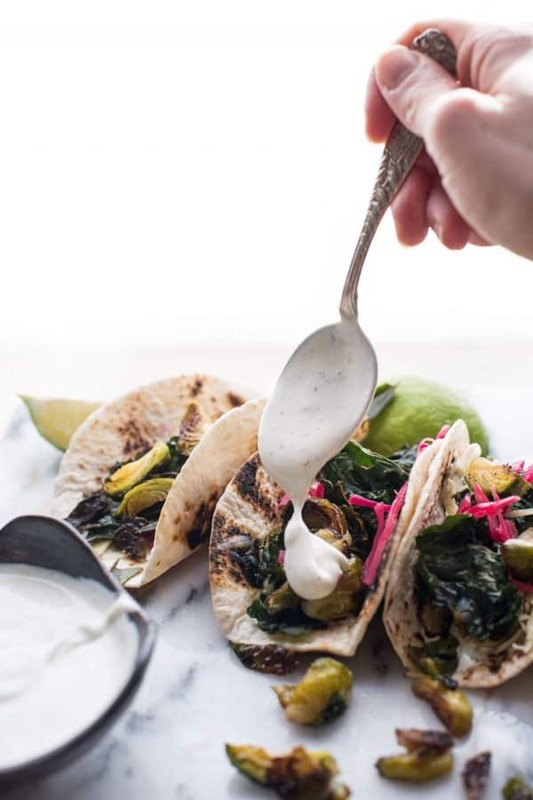 Well, we are taking tacos to a whole new level but it’s really more about taco goodness and all the things playing so so well together than it is about just the kale. Your mouth is going to be SO HAPPY, promise omise. Seriously, my mom and dad tried to hide skeptical eyes (jk, they didn’t hide it at all) before throwing caution to the wind, biting into these vessels of vegetarian heaven and loving them. 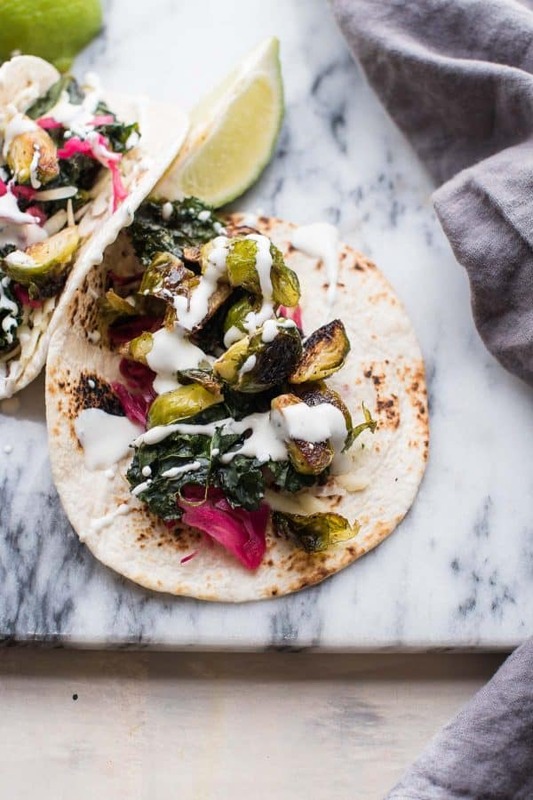 Crispy Kale and Brussels Sprout Tacos play on all the good things about taste, like…. 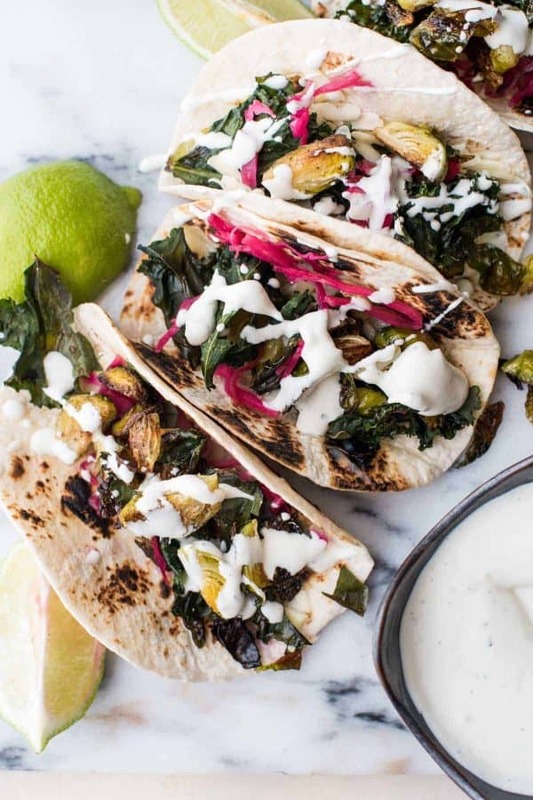 These bad larrys are going to change your mind about vegetarian tacos. I just know it. Trust me, the carne asada love in this house runs deep, but sometimes you just need to lighten things up without loosing any flavor. So, let’s be totally honest. If you put just crispy kale and sprouts on a tortilla, it’s gonna be lame-city, USA. The thing(s) that makes these tacos superior is all the fixings that go on it. And listen, I’m just going to say it….I LOVE FLOUR TORTILLAS. I love them. They are delicious and sturdy and tender, and they don’t get mushy with the slightest bit of moisture. I don’t care if it makes me uncool to pass up corn tortillas – you’re more than welcome to use corn tortillas – hell, sometimes I do love me a good corn tortilla, but most of the time when it comes to tacos I’ll just be over here living the flour tortilla life, being true to myself and what not. So after you toast up that tortilla, sprinkle on that cheese to get all melty. 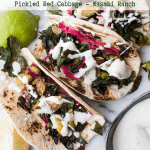 You can follow that up with my favorite sandwich and taco topper – quick pickled red cabbage. 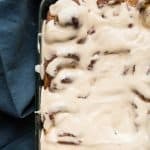 Its so ridiculously easy and adds so much good flavor. 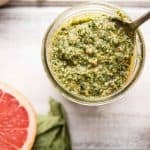 Then you’ve got the main characters – sprouts and cabbage – and while they’re dressed to impressed, you should accessorize them with a little wasabi ranch for a tangy, spicy zing. You see?? These tacos are so so much more than hipster vegetables in a flour tortilla. Come to the kale side with me, it’s going to be tasty. 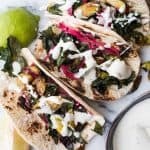 The best vegetarian tacos! Crispy kale, roasted brussels sprouts, pickled red cabbage, melty cheese, and tangy wasabi ranch. 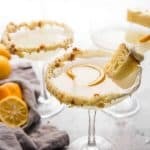 Simple and delicious! Preheat the oven to 375°F. While the oven preheats, trim the brussels sprouts by removing the bottom stem and cutting in quarters, set aside. For the kale, remove the leaves from the stems. Tear into larger than ‘bite sized’ pieces. 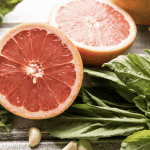 Place in a large bowl, drizzle with 1 tablespoon of oil and toss to make sure all the kale is covered with oil. Set the kale aside. 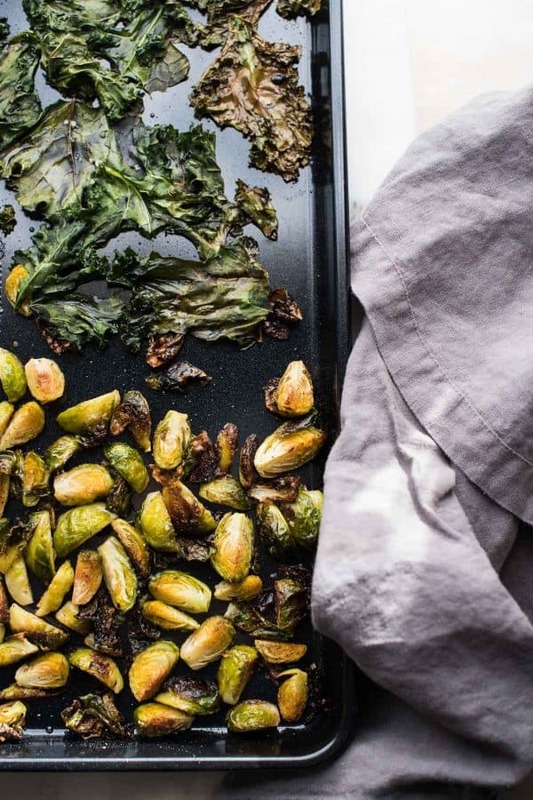 Arrange the brussels sprouts on a baking sheet and drizzle with 3 tablespoons of oil. Season with salt and pepper. Spread them out on the baking sheet so there is plenty of room (the sprouts will crisp up better with more room). Cook for 15 minutes, stir and move to half of the pan. On the other half of the pan lay the pieces of kale flat – they can be close together. 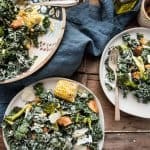 Sprinkle the kale lightly with salt and bake with the sprouts for another 15 minutes. While the vegetables finish cooking, toast the tortillas. If you have a gas stove, this can be done carefully on the burger with the heat on low. If you do not have a gas stove or that’s to close to the fire, toast each tortilla in a sauté pan until the outside starts to turn a golden brown. Layer with shredded cheese and set off to the side. 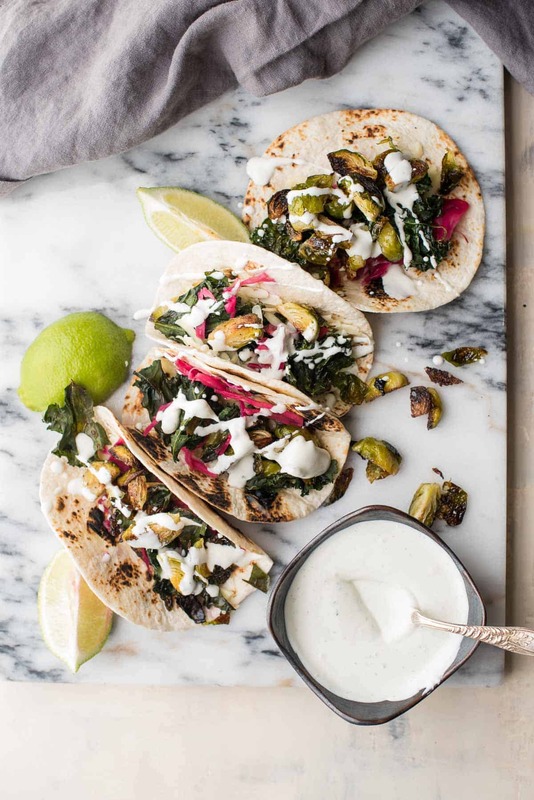 Layer the tacos with picked red cabbage, brussels sprouts and crispy kale. Finish with a drizzle of wasabi ranch on top and enjoy! In a small bowl, combine the sour cream, ranch seasoning and wasabi paste. Whisk thoroughly until combined. Depending on the brand of sour cream, you may need to add 1 tablespoon of water to get it to easily drizzle with a spoon. Corn tortillas can be substituted for flour tortillas. Below are affiliate links for services used on or to help develop Hunger Thirst Play. The price you pay doesn’t change, but I make a commission on the sale. Thank you for your support!